This listing is for 20 Shabby Funnels. Place in a basket, bin, metal bucket and more. Fill with popcorn, taffy, cotton candy galore!!! 9" from bottom tip to the top opening where the popcorn would start. 13" from bottom tip to the very top tip of funnel. 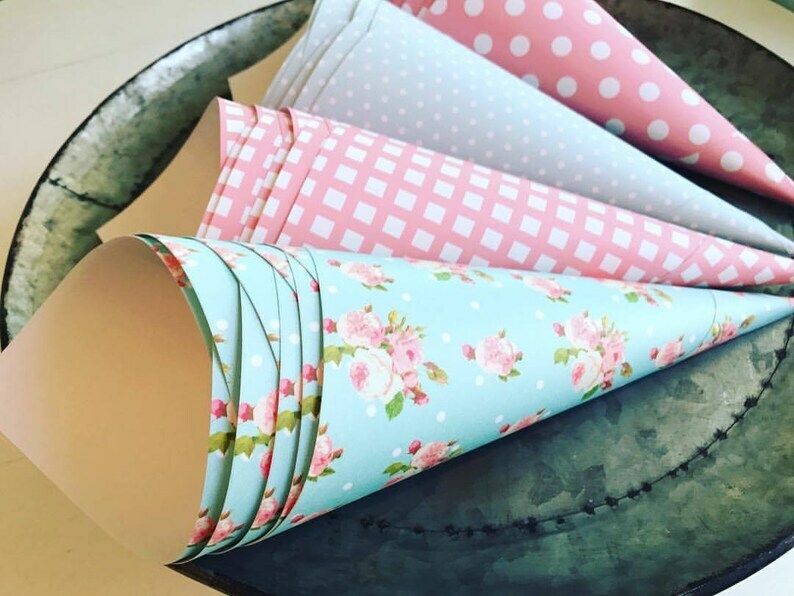 These funnels go great with my coordinating Shabby Chic Party Collections. Adorable! Excellent edition to the rest of the decoration Andrea helped us with. Great quality, fast delivery and amazing service from Andrea. These will be used on the candy table. Love the designs and colors! These funnels are perfect! I ordered them for the "shabby chic" design and could not be more pleased. They are actually larger than I anticipated. So you can use them for more than just popcorn. Great purchase!